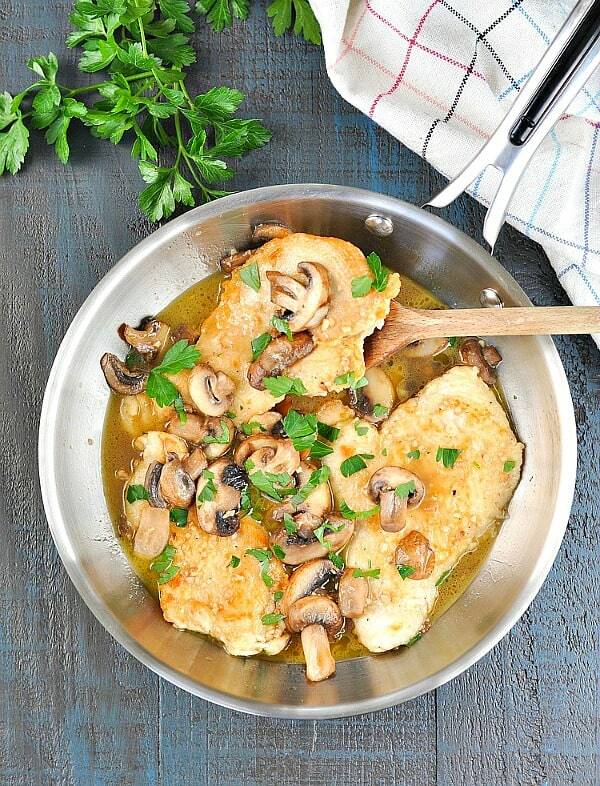 A classic and easy chicken marsala made in only 20 minutes all in one skillet. 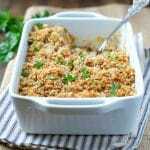 This is a dish full of flavor that can be served with vegetables or pasta! Just because you don’t have a lot of time to cook dinner, doesn’t mean that you have to settle for packaged food, carry-out, or the same old spaghetti! With only 5 minutes of prep, this 20-Minute Chicken Marsala is an easy dinner to enjoy on a busy night. It’s restaurant-quality food with minimal effort (in other words, the best of both worlds)! 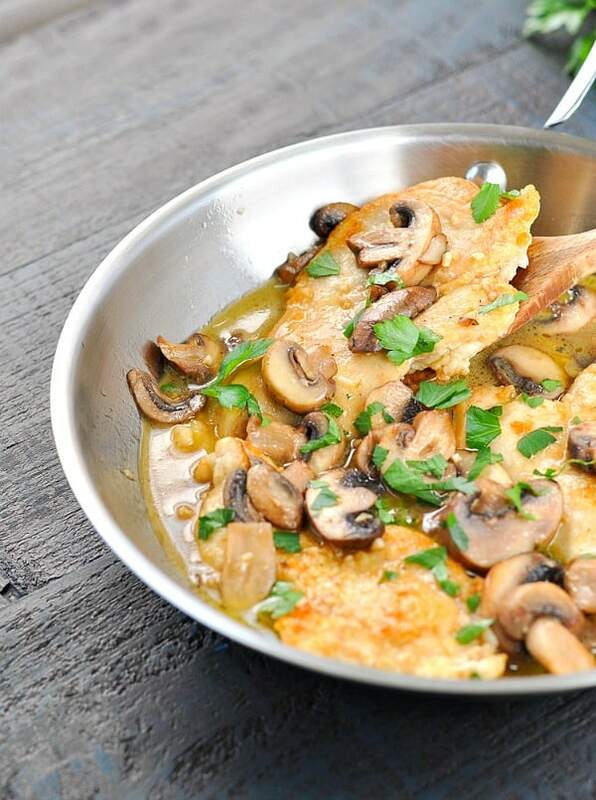 Is Chicken Marsala one of those dishes that you only order when you’re at a restaurant? Until recently, I just assumed that the fancy-sounding name implied a difficult, intimidating dish. But oh, I was so wrong! You only need a few ingredients to pull off this meal, and you probably have most of them in your kitchen already. The pan-fried chicken is swimming in a simple mushroom wine sauce, which gives the dish an incredibly rich flavor without any extra effort. 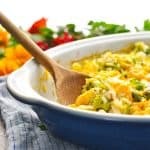 It’s perfect when served with pasta, mashed potatoes, or crusty bread to soak up the broth; or you can go the low-carb route and opt for zucchini noodles or cauliflower rice instead. I made the Chicken Marsala kid-friendly for my own family by diluting the wine with an equal amount of chicken broth. And don’t worry — the alcohol cooks off as you simmer the sauce! If you prefer a stronger wine flavor for your Chicken Marsala, feel free to use 1 full cup of wine and omit the broth entirely. 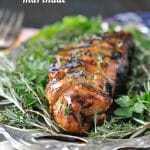 Just make sure that you’re using a good quality Marsala for this meal, since it’s the prominent flavor in the sauce. You don’t want to buy the cheaper “cooking wine” because it doesn’t taste nearly as good. To make creamy chicken marsala simple add a splash of cream to the sauce after adding the garlic and butter. How much is up to you but to keep the marsala flavor prominent I’d go for around 2 tbsp of cream. Thin-sliced chicken breasts are a nice short-cut to save you a step in the preparation process. If you can’t find thin-sliced chicken breasts at your grocery store, just buy regular chicken breasts and cut them in half horizontally or place them between wax paper and pound flat with a wooden mallet. Cooking for Two? I would suggest using just 1/2 lb. of chicken, while keeping the rest of the ingredients the same. You can never have too much of the delicious wine sauce! Enjoy the comfort of your family around the table while you wind down and reconnect. 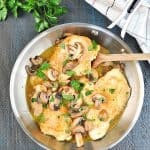 This 20-Minute Chicken Marsala is a simple, fresh, and delicious way to end a busy day — without any added stress! Place about ½ cup of flour in a shallow bowl. Add salt and pepper; stir to combine. Dredge the chicken through the flour mixture until coated on all sides. Shake off any excess flour. Set chicken aside. Heat the oil in a large skillet over medium-high heat. Add chicken to the skillet and cook until lightly browned on both sides (about 3-5 minutes per side). Lower heat to medium. Place mushrooms in the skillet, stirring and cooking until tender (about 5-7 minutes). Take the skillet off of the heat; add the wine and the chicken broth. Place the skillet back on medium heat, and stir to scrape up any bits from the bottom of the pan (this gives the sauce so much flavor!). Add garlic and butter to the skillet. Simmer the sauce for about 5 minutes to allow it to reduce and thicken. Season with salt and pepper, to taste. Add chicken back to the skillet and serve immediately. Garnish with fresh parsley. 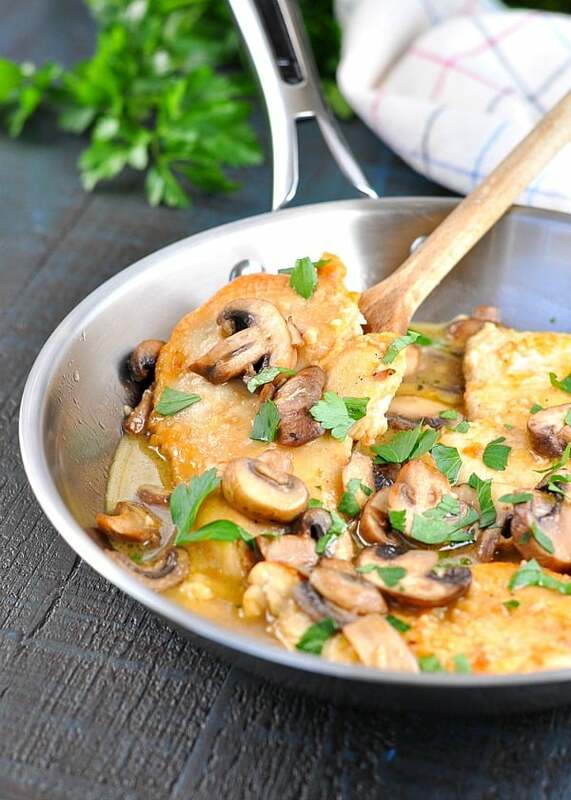 To make creamy chicken marsala simple add a splash of cream to the sauce after adding the garlic and butter. How much is up to you but to keep the marsala flavor prominent I'd go for around 2 tbsp of cream. 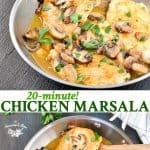 20 minutes for chicken marsala?! Sign me up! 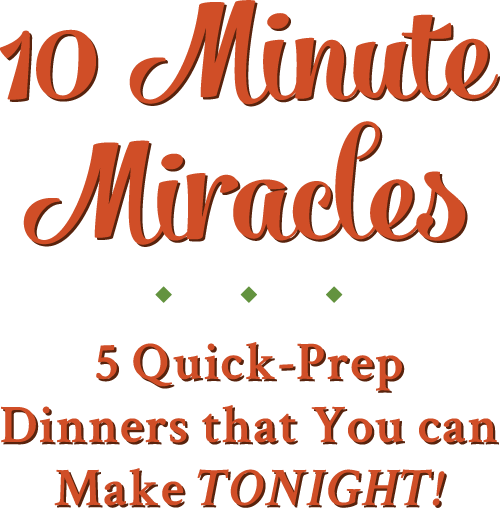 This is one of my husband’s favorite dishes, so I love how easy this is to prepare. Perfect for when I don’t want to stand over a stove for hours! This looks amazing Blair! I have a whole thing of mushrooms I’ve been trying to figure out what to do with. Time to make this! The mushrooms are SO key in this dish, Megan! Love them with the sauce!!! Love this recipe Blair. It’s healthy, seasonal, full of wonderful flavours and super easy to make. Perfect for busy families. Mushrooms are now totally in season, so I can’t wait to try this recipe. Dry white wine with a splash of brandy should be perfect! Hey, Amanda! Do you have brandy available? Marsala is a brandy-fortified wine, so you can try this substitute: mix together 1/2 cup of white wine + 2 teaspoons of brandy. Use that mixture in place of the marsala. If you don’t have brandy, then I would go with a white wine…but it will obviously change the taste of the dish. 🙂 Enjoy! 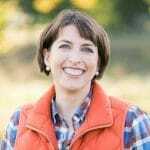 Will it be ok to omitt wine person is recovering alcoholic? 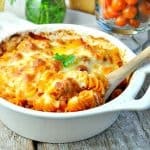 Do I have to make more sauce if put over pasta or will there be enough sauce in this recipe to coat the pasta? I tried it tonight, it’s so delicious! And my whole family loved it. I paired it with homemade mashed potato and steamed green beans and carrots. 😋 Thank you! Great! I’m so glad that your family enjoyed it, Estela! Thanks for letting me know! I made it last night. It was delicious. Do you know if can make this dish the day before and still be good? Will the sauce still be good? I made it last night. It was delicious. A+++ Do you know if I can make this dish the day before and still be good? Will the sauce still be good?